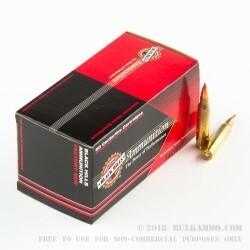 This .223 Remington ammunition from Black Hills Ammunition excels against larger varmints such as coyotes while still maintaining dependable performance against rabbits, nutria, and other smaller animals. An excellent choice if you want to put your AR-15 or other .233 Rem/5.56 NATO rifle to work clearing out pests! 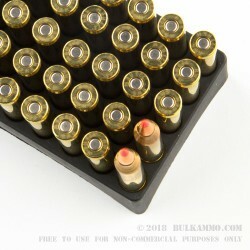 Each cartridge in this box of 50 fires a 50 grain Hornady V-MAX jacketed hollow point bullet at a muzzle velocity of 3,300 feet per second. 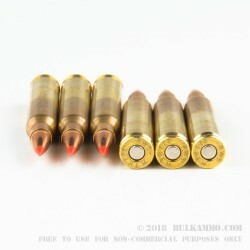 This ammo fires a relatively heavy bullet for a varmint load and thus produces better penetration in addition to heavy fragmentation. V-MAX bullets are polymer tipped for improved accuracy; the tip also helps produce more consistent expansion. Black Hills ammo is made in Rapid City, South Dakota using non-corrosive Boxer primers and reloadable brass cases. BHA is a well-known manufacturer of high-quality ammo for competition, hunting, and defense and sells ammo to both the general public and all branches of the US military.